HipHooray, we've had a birthday in the house, and tell me, who does not love a good birthday party? It only seems like yesterday this little man came into our lives, but wowsers the years have flown and our Oscar turned 6 last week!! Because life has been so hectic in household Stevens we had to delay a few days and managed to celebrate his birthday yesterday. When you're on the go and flat-tack, just like I've been these last few weeks, I really do think you need to plan time super carefully - maximum bang, from minimum fuss! 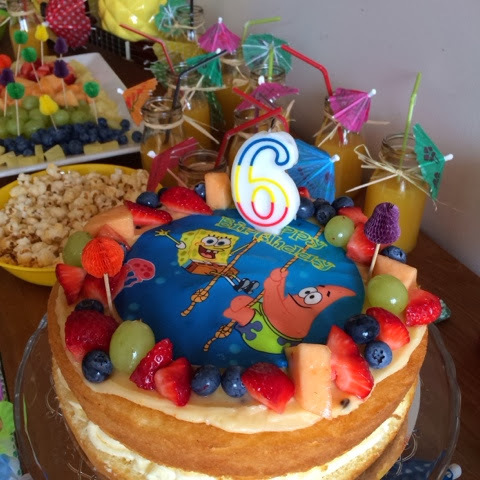 We are big fans of birthday parties, and knew the day had to be special for Oscar, but when you put your mind to it with a plan, it's possible to hold a cracker of a party with minimum fuss and preparation. 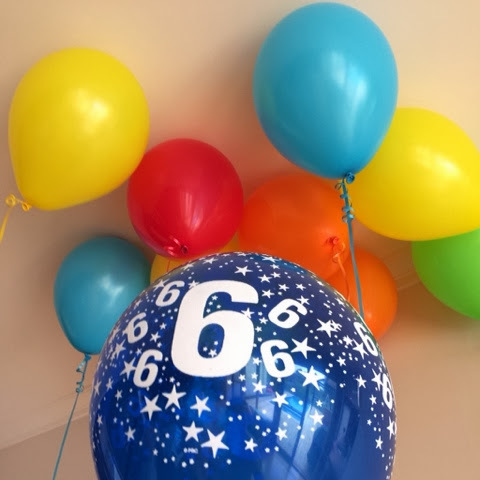 This is how I managed to arrange a party for our birthday boy in under 6 hours!!! Spongebob is Oscar's character if choice - he loves him! He also loves water - both pool and ocean, and so logically the initial plan was for a pool party. Unfortunately the dreadful Ballarat weather was not in agreement and we were resigned to entertaining the party guests indoors. Balloons are easy to outsource and by ordering them first up in the morning, I could collect them within 2 hours. A true time saver and they looked great, don't you think? 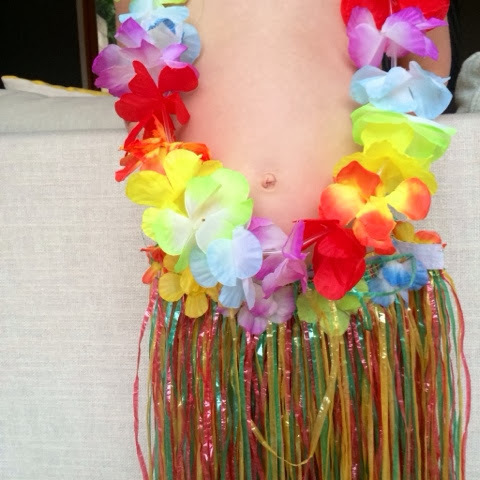 With the clock ticking, I then devoted some energy to running around looking to find grass skirts, table decorations, shells, leis, cocktail umbrellas and anything that looked remotely "Hawaiian" and that I could easily get my hands on. My efforts were well rewarded and I managed to get home by 1pm, tropical props in hand, to start decorating the place and making preparations for the food! It was action stations! 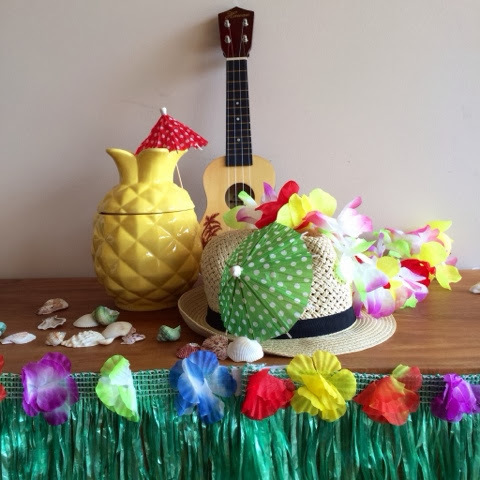 Luckily I had my favourite pineapple, a funky fedora hat and ukulele from Hawaii (a souvenir purchase Adrian and I made when we married in Hawaii, 2006) as the basis for the afternoon. They became my centrepiece decorations and everything else fell into place around them, surprisingly easily too! 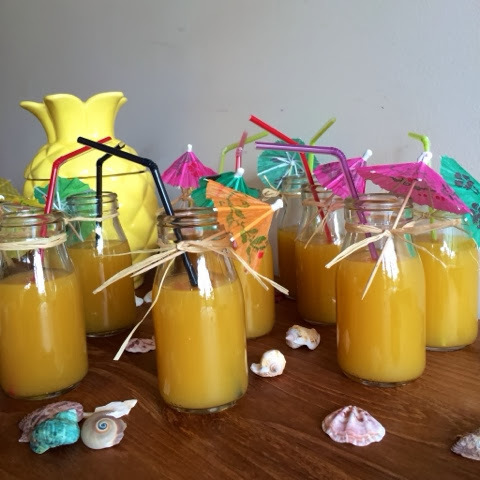 Drinks were easy - Tropicana juice with no added sugar, preservatives or additives. I had timing down to the wire as five minutes before Oscar's guests arrived, I was busily tying straws around the necks of bottles whilst my adorable big helper, Mietta, opened up all the cocktail umbrellas. 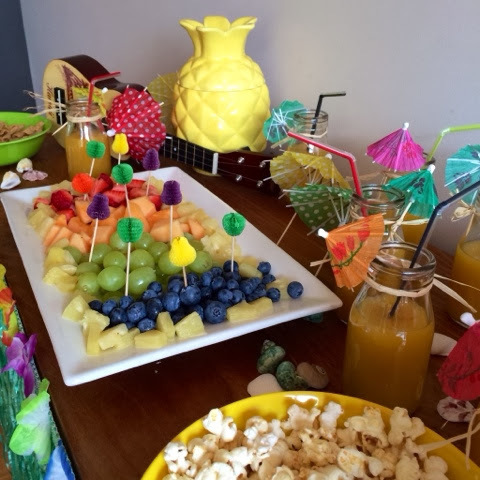 I kept snacks very simple with colourful fresh tropical fruit and loads of tasty popcorn. I was right in betting on the kids being more interested in playing than in fancy food and these healthy options were still fun enough to satisfy them as party starters. 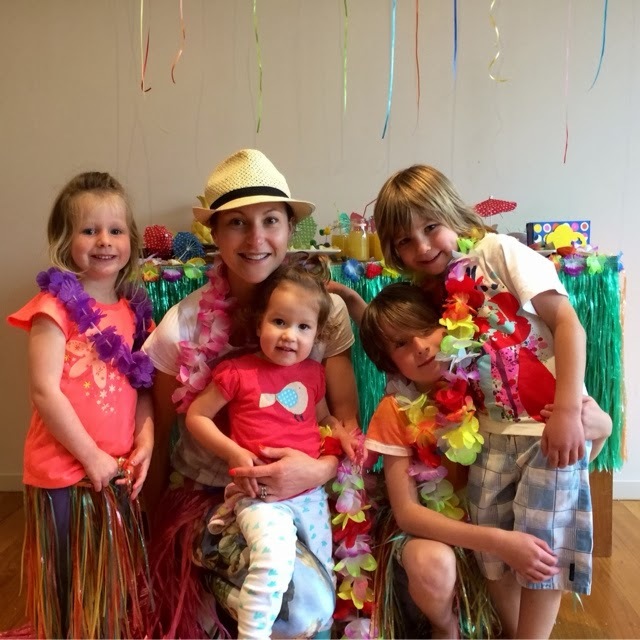 Just how cute are these grass skirts and leis? 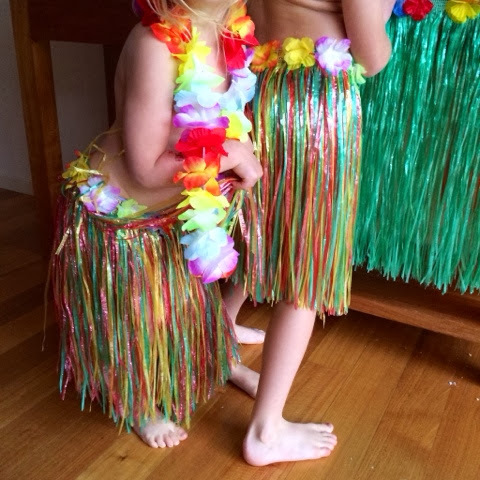 I'd recommend having a Hawaiian themed party if only to see your littlies dressed up like this! Adorable! As Oscar's little party guests arrived, I started getting the warm food ready. 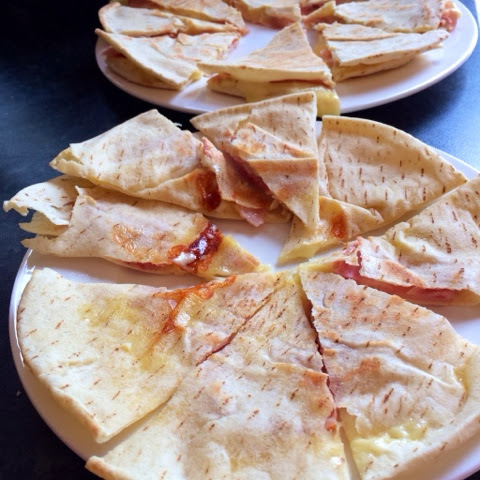 Super easy pocket ham and cheese pizzas - being quick, tasty and universally loved by kids they ticked all the boxes and were a hit! I can assure you that this plate of pizza slices did not last long after being photographed! 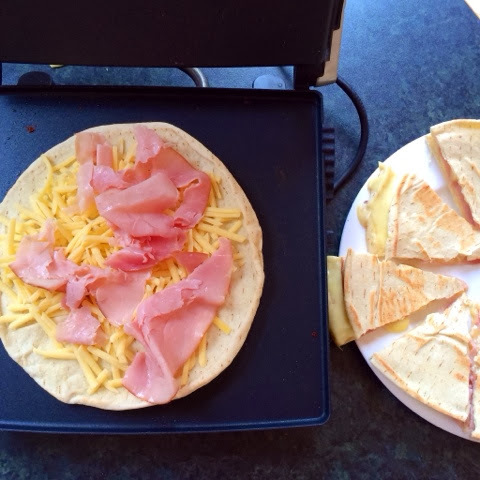 It was quicker and easier to prepare these freshly than it would have been to either heat unhealthier frozen ones or order greasier ones in from the store. I'd call that winning, wouldn't you? The activities were easy to organise and included those party games that kids never tire of - bobbing for apples and statues were probably the firm favourites. You can see from the smiles and laughter below that Oscar's mates all had a fantastic time! We all did! Happy 6th Birthday, Oscar! You are such a little rockstar and bring so much joy to our lives. 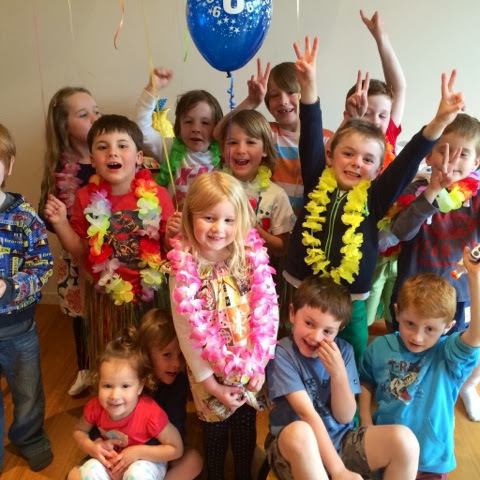 So there you have it, a rocking kids party, all in under 6 hours from start to end! Phew! Have you ever planned something short notice and pulled it off to be a cracker? I'd love to hear about it! Workout Wednesday, who's heard of Malcoms?